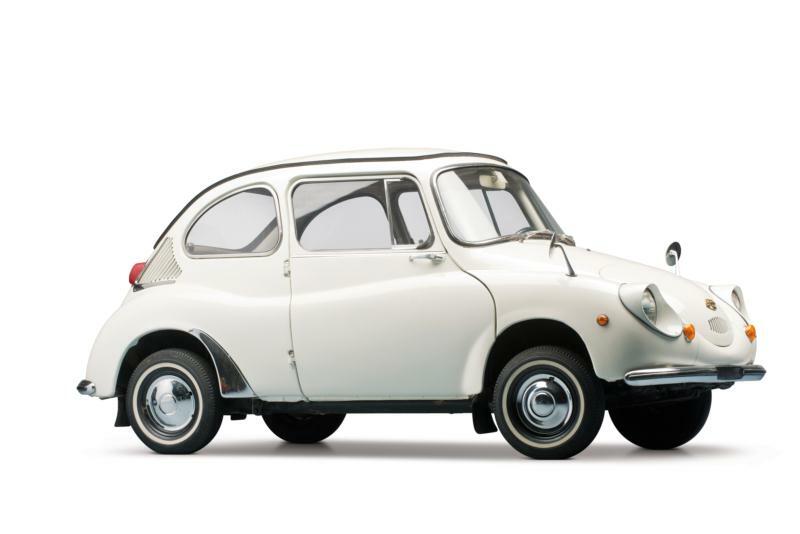 In a manner similar to how the Volkswagen Beetle was born decades earlier, the Subaru 360 came about as the result of a set of governmental regulations that promoted the building of an inexpensive, lightweight national car for the masses. The mid-1950s Japanese government laid down a set of rules offering tax and insurance relief for cars of 360 cc or less, and Subaru's entry into this market in 1958 was the delightful 360, so named for its 356-cc, 16-hp,,two-stroke, two-cylinder I-2 motor. This tiny "ladybug" was made of pressed steel monococque construction and rode on a 70.9-inch wheelbase with the engine mounted in the rear and a three-speed transaxle driving the rear wheels. Cockpit entry was afforded by suicide style rear-hinged doors. Much patience was required when waiting out the 30 or more seconds it took to accelerate to this little Subaru's 60 mph top speed; however relief was forthcoming with the 25- and 36-hp versions that came later. Additional improvements included a self-mixing oil and fuel system in 1964, as well as an available four-speed gearbox. Just over 390,000 were built from 1958-71. In addition to the coupe, other versions included: the Custom, a convertible, a two-door wagon, and the Sambar model—with a choice between a van and pickup. Subaru gained its foothold in America when a then-unknown Malcolm Bricklin embarked on the first of his forays into the auto business by importing 6,000 cars into the US from 1968-70. They proved to be a difficult sell on US shores, but they have provided the basis for a small but thriving enthusiast community that restores and maintains them in America today.